The benchmark Index NIFTY50 consolidated on expected lines and did not move out of the congestion zone but the session remained much weaker than expected. However, given the global weakness that we witnessed, the domestic equity markets relatively outperformed the other markets. We have a short week as Thursday remain the last trading day of the current week with Friday being a trading holiday. We expect this weakness to persist and consolidation to continue. However, we also strongly expect the 100-DMA to continue to hold on as support at Close levels. No downsides beyond this are expected. Going into trade on Thursday, the levels of 10535 and 10590 will act as immediate resistance for the Markets. The supports come in at 10450 and 10435 zones. 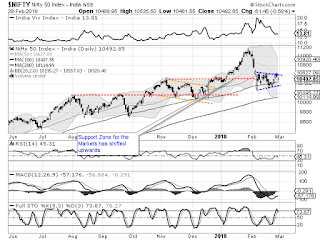 The Relative Strength Index – RSI on the Daily Chart is 45.3143 and it remains neutral showing no divergence against the price or any failure swing. The Daily MACD still remains bearish though it continues sharply narrow its trajectory and moving towards positive crossover in immediate short term. A falling window occurred on Candles. This is a gap down and usually implies persistence of the downtrend. However, this cannot be read singularly. Given the fact that it is very near to the important support of 100-DMA, it can have limited negative impact. 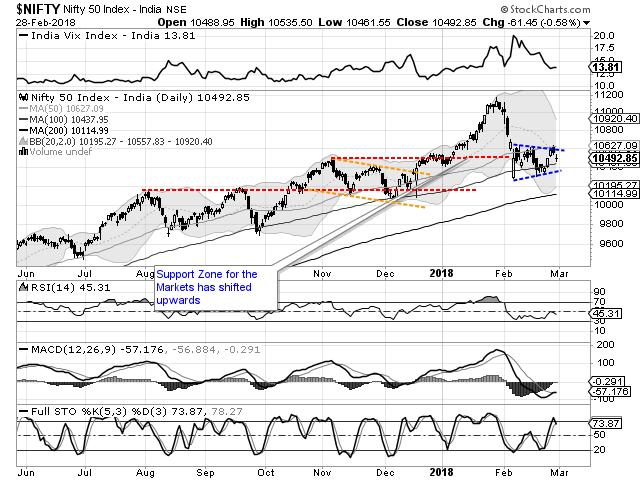 If we look at pattern analysis, it is clear that the NIFTY still remains in the congestion zone that it has created for itself. It will break out of this zone only after it moves past 10590-mark. Until this happens, it is likely to remain in this zone while trading above its critical supports. All in all, so long as the NIFTY remains in this congestion area, it will stay at the mercy of its immediate support zone of 10276-10310. However, before that there is 100-DMA which stands at 10437 that it is very much likely to defend. We do not see any likely breach of any of these critical support areas. Apart from banks which will remain largely affected by news flow, we will continue to see bottom fishing in good quality stocks. With no critical supports yet broken, we recommend avoiding shorts and keeping overall exposures at modest levels. Resilient technical set up is seen in stocks like ASIAN PAINTS, HEXAWARE, OMAXE, EIH LIMITED, SIEMENS, MAX VENTURES, TV18 BROADCAST, FUTURE LIFESTYLE, BHARAT BIJLEE, DBCORP and KALPTARU POWER.